Quite a number of steps to climb to reach the theater, please allocate enough time for drop off’s. Parking is NOT free, please plan for purchasing the tickets. 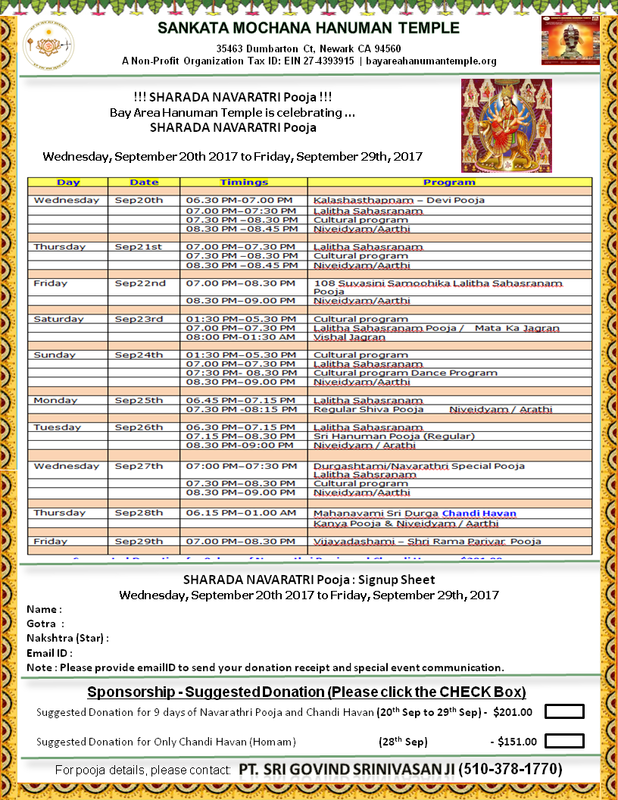 Sharada Navaratri Pooja, Wed, Sep 20th to Friday, Sep 29th 2017. Cultural Program during Navartri Celebration – Sep 20th to Sep 30th. 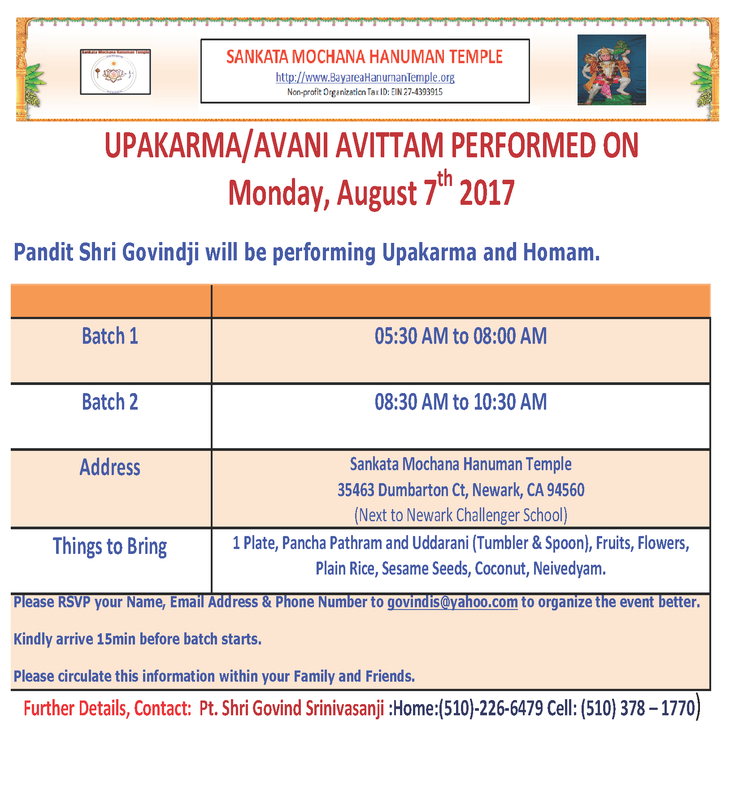 Samaveda Upakarma will be performed on Thursday, Aug 24th from 7:00 am to 8:30am. 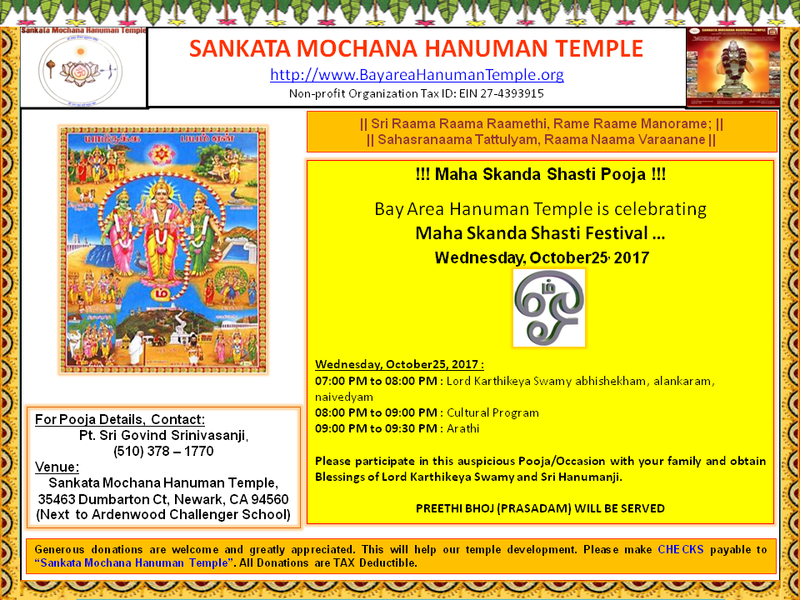 There will be only One batch and devotees are requested to contact Pandit GovindJi @ 510-378-1770 to make arrangements. Sri Narasimha Jayanthi Celebration – Sri Lakshmi Narasimha Moola Mantra Havan – Tuesday, May 9th @6:30pm. Akshaya Tritiya and Adi Sankara Jayanthi – April 28th Friday and April 29th Saturday. 07:00 PM – 08:30 PM Sri Ram parivar pooja/ abhishekam followed by a procession during which Hanuman Chalisa will be chanted. Preethi bhoj will be served. 17th Year Pandit Govindji is performing this Homam. 05:30 PM : Expected Return to temple. 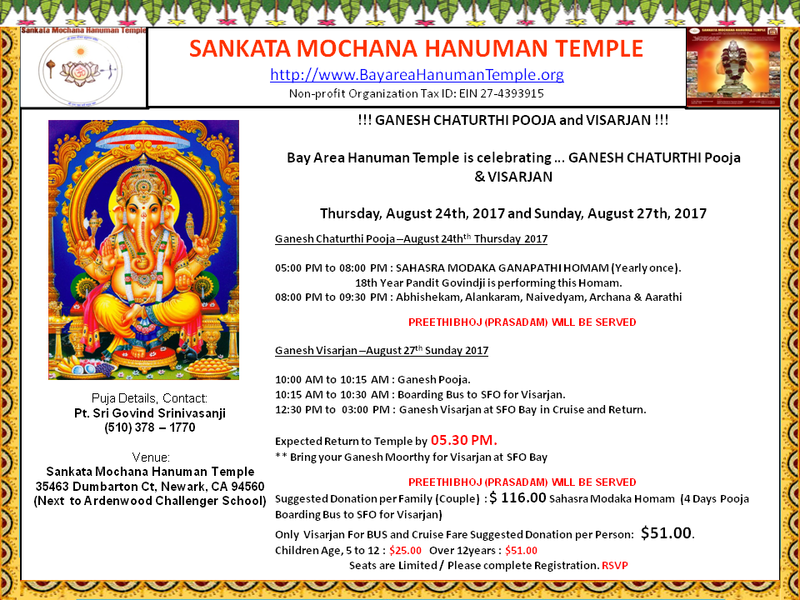 Bring your Ganesh Moorthy for Visarjan at SFO Bay. 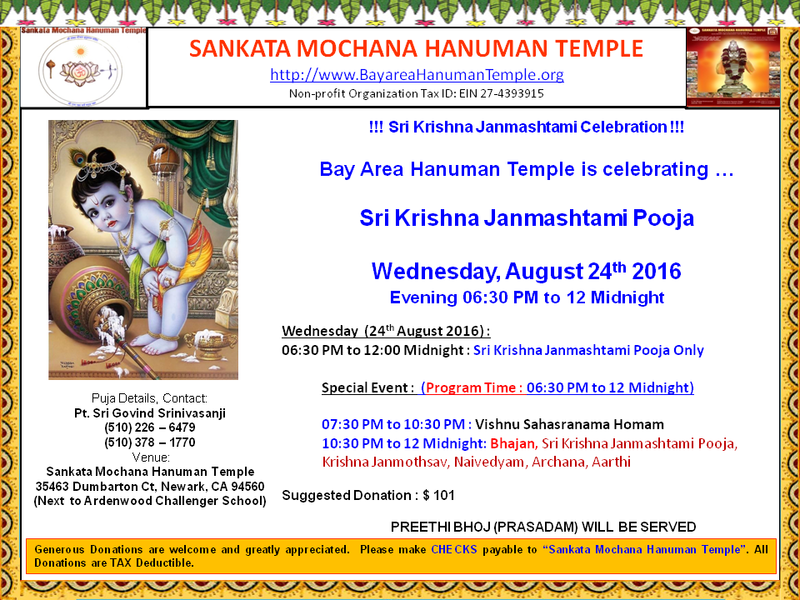 11:30 pm to Midnight: Sri Krishna Janmashtami Pooja, Krishna Janmothsav, Naivedyam, Archana, Aarti. 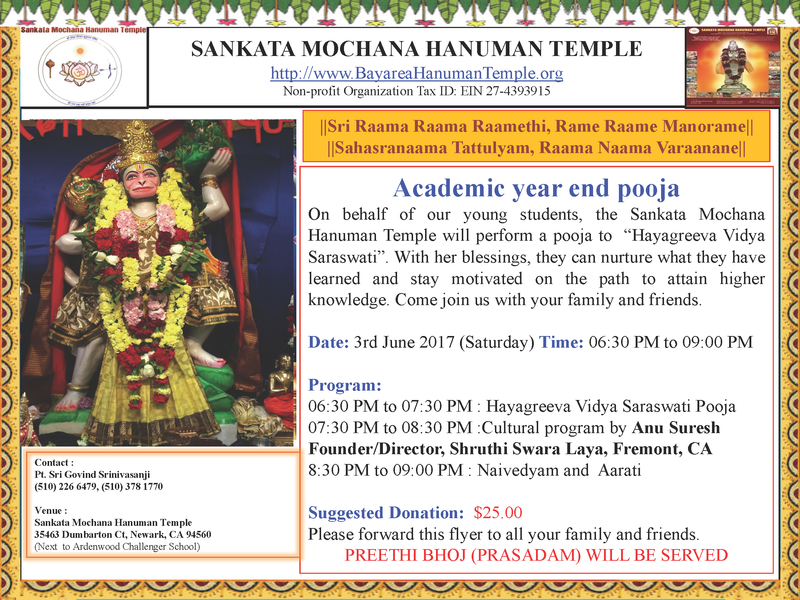 Academic year end – Hayagreeya Vidya Saraswathi pooja: Saturday, June 11th. Our young students have worked hard thru this academic year, gaining knowledge along the way. This is a special pooja to offer our gratitude and pray for their continued success. You are cordially invited to participate in this pooja with your family & friends and obtain the blessings of Goddess Saraswathi and Sri Hanumanji. It will be followed by a cultural music program presented by the students of Sruthi Swaralaya. You can also participate in the Ramakoti writing drive during this program. Writing materials will be provided. Preethi Bhoj (Prasadam) will be served after the Naivaidyam and Aarti. June 11th: 06:30 PM to 07:30 PM : Hayagreeva Vidya Saraswati Pooja. June 11th: 07:30 PM to 08:30 PM : Cultural program by Sruthi Swaralaya (students of Anu and Manasa Suresh). June 11th: 08:30 PM to 09:00 PM : Naivedyam and Aarti. You are cordially invited to participate in this auspicious homam and pooja with your family & friends and obtain the blessings of good health, courage and prosperity; from Lord Sri Laxmi Narasimha, Sri Sudarshana and Sri Hanumanji. It will be followed by a cultural program presented by the Sri Paduka Academy. Preethi Bhoj (Prasadam) will be served. May 21st: 10:30 AM – 12:00 PM: Sri Lakshmi Sudarsana Narasimha Moola Mantra Homam (Havan), Poornahuti. May 21st: 12:00 PM – 1:00 PM: Artists from Sri Paduka Academy, Artistic Director Sri Hari Devanath. A grand three day third anniversary celebrations which also highlights Sri Hanuman Jayanthi. It is the culmination of the Ramakoti Patram drive. Preethi bhoj (prasadam) will be served on all three days. On Friday. the SriSuktham (Havan) will be performed, On Saturday, i.e. Sri Hanuman Jayanthi there will be Hanuman Chalisa chanting from 10:30 AM to 6:30 PM. It is followed by a homam and the Sri Ramkoti samarpan. 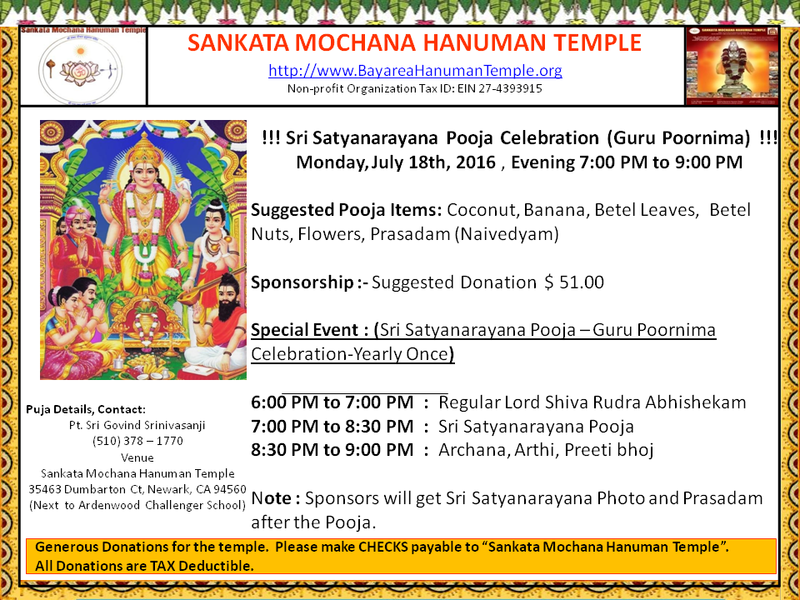 There are several pujas one can sponsor and help support the temple . We invite you to join us and help make it a grand event. Friday, Apr 22nd: 7:00 PM – 8:00 PM: Sri Suktham (Havan). Friday, Apr 22nd: 8:00 PM – 9:30 PM: Sri Lakshmi abhishekham, archana and aarati. Saturday, Apr 23rd: 10:30 AM – 06:30 PM: Sri Hanuman Chalisa Path. 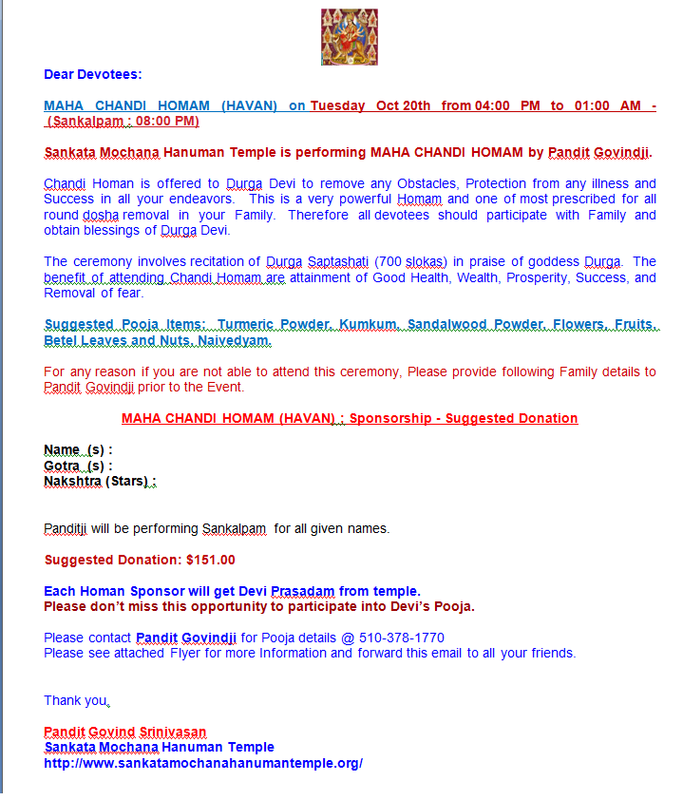 Saturday, Apr 23rd: 7:00 PM – 9:00 PM: Homam (Havan), Sri Ramakoti samarpan, aarati. During the week, Pandit Govind Srinivasan for the sixteenth year will read the complete Sri Valmiki Ramanayam which comprises of over 20,000 slokas. Thursday, Apr 7th – Friday, Apr 15th: 9:30 AM – 02:30 PM & 5:00 PM – 7:00 PM: Valmiki Ramayana parayanam, naivaidyam and aarati. Thursday, Apr 7th – Saturday, Apr 16th: A ten day Carnatic and Hindustani music festival which highlights performances of teachers and students from leading Bay area music schools. Several activities are planned for the weekend celebrations. We invite you to join us during these auspicious times. Preethi bhoj (prasadam) will be served on both the days. 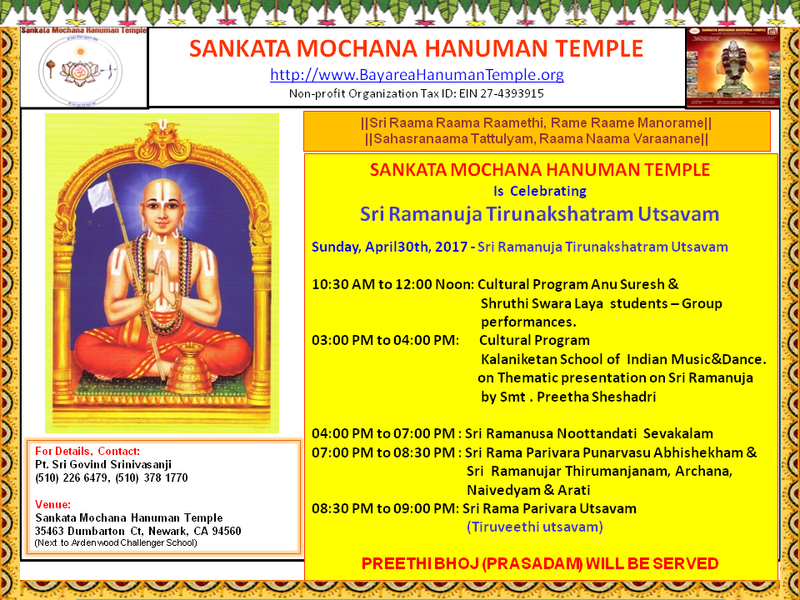 Friday, Apr 15th: 12:00 PM – 01:30 PM: Sri Ramajanma utsavam, naivaidyam and aarati. Friday, Apr 15th: 7:00 PM – 09:00 PM: Sri Rama Pattabhishekham, naivaidyam and aarati. Saturday, Apr 16th: 4:00 PM – 7:00 PM: Sri Seetha Rama kalayana utsavam, naivaidyam and aarati. We continue the drive for collecting 10000 Ramakoti patrams by Hanuman Jayanthi. Please join us in this effort. Pandit Govind Srinivasan will start reading the Rambhaktha (devotee) names off the Ramakoti patrams on Hanuman Jayanthi i.e April 21st. 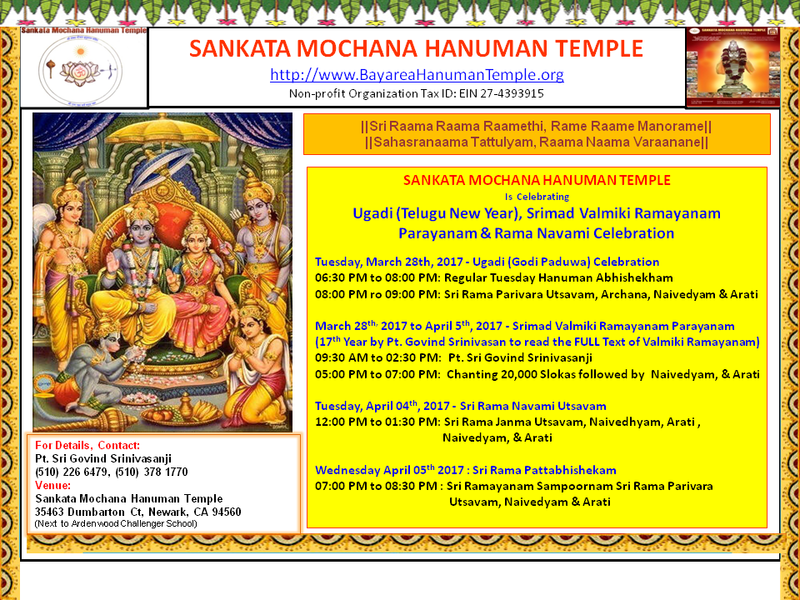 Thursday, Apr 7th: 9:30 AM – 02:30 PM & 7:00 PM – 8:00 PM: Valmiki Ramayana parayanam, Sri Rama Parivara Utsavam,, naivaidyam and aarati. Leading local Carnatic and Hindustani music schools will participate in this festival that highlights daily music concerts starting on April 7th through the April 16th. Thursday, Apr 7th: 7:00 PM – 8:00 PM Geeta Seshadri School. Friday, Apr 8th: 8:00 PM – 9:00 PM Ananya Ashok (Vocal), Sruti Sarathy(Violin), Vignesh Venkatraman(Mridangam) . Saturday, Apr 9th: 12:00 PM – 1:00 PM Bhajans by Neel Sarkar from Neels-Nirvana Music Meditation Yoga training school; accompanied by a guitarist and other vocalists. Saturday, Apr 9th: 1:00 PM – 7:00 PM Preeta Seshadri School. Sunday, Apr 10th: 10:00 AM – 11:00 AM Dr. TN Arunagiri (Vocal), Dr. Saravanapriyan Sriraman(Violin), Shri. Natarajan Srinivasan (Mridangam). Sunday, Apr 10th: 1:00 PM – 1:45 PM Shreyas Srinivasan ( Violin), Achyut Srinivasan ( Mridangam). Sunday, Apr 10th: 1:50 PM – 2:35 PM Aditya Satyadeep (Violin), Achyut Srinivasan ( Mridangam). Sunday, Apr 10th: 2:45 PM – 4:00 PM Students of Shruthi Swara Laya ( Vocal), Shreyas/Aditya( Violin), Achyut( Mridangam). Sunday, Apr 10th: 4:30 PM – 7:00 PM Manasa Suresh (Vocal), Sruti Sarathy (Violin), Akshay Venkatesan (Mridangam). Monday, Apr 11th: 8:00 PM – 9:00 PM Anu Suresh (Vocal) Shreyas Srinivasan (Violin), Achyut Srinivasan (Mridangam). Tuesday, Apr 12th: 7:00 PM – 8:00 PM Sruti Sarathy (Violin); Akshay Venkatesan – Mridangam. Wednesday, Apr 13th: 7:00 PM – 8:00 PM Vijay Narayanan (Vocal); Keerthi Sundaramurthy (Violin) and Aditya Sriram (Mridangam). Thursday, Apr 14th: 7:00 PM – 8:00 PM Shashank Mahesh (Vocal); Shreyas Srinivasan (Violin) and Varun Viswanath (Mridangam). Lord Shiva pooja and Rudrabhisekham will be performed at two hourly intervals starting at 9:30 AM. These poojas will continue through the night until 5:30 AM of March 7th. Later in the evening, the Maha Mrithyunjayam japam will be chanted and a Lord Shiva abhisekham and aarati will be performed. Preethi bhoj (prasadam) will be served on both days. We invite you to join us and help make it a grand event. Sunday, March 6th: 9:30 AM – 11:00 AM: Lord Shiva pooja and Rudrabhisekham. Sunday, March 6th: 12:00 PM – 1:00 PM: Lord Shiva pooja and Rudrabhisekham. Sunday, March 6th: 2:00 PM – 3:00 PM: Lord Shiva pooja and Rudrabhisekham. Sunday, March 6th: 4:00 PM – 5:00 PM: Lord Shiva pooja and Rudrabhisekham. 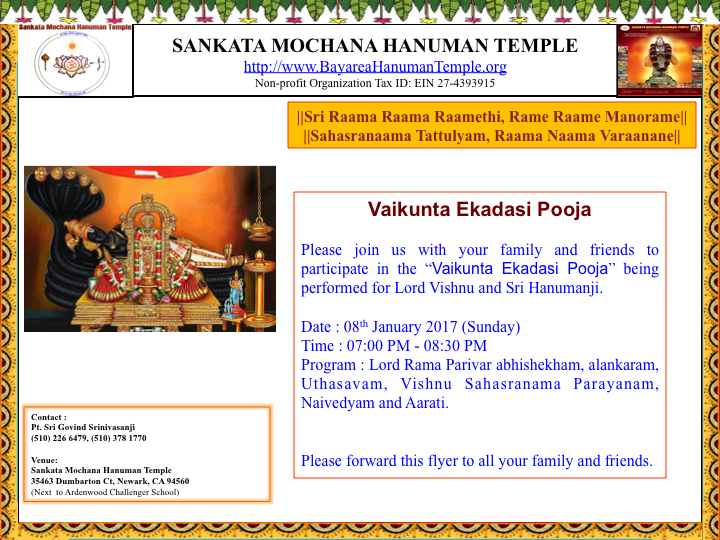 Sunday, March 6th: 6:30 PM – 12:00 AM: Prathama Kala Pooja, Mahanyasa Rudra Ekadashi Pooja and Rudrabhishekam. Monday, March 7th: 1:30 AM – 2:30 AM: Dwitiyakala Vishesha Pooja. 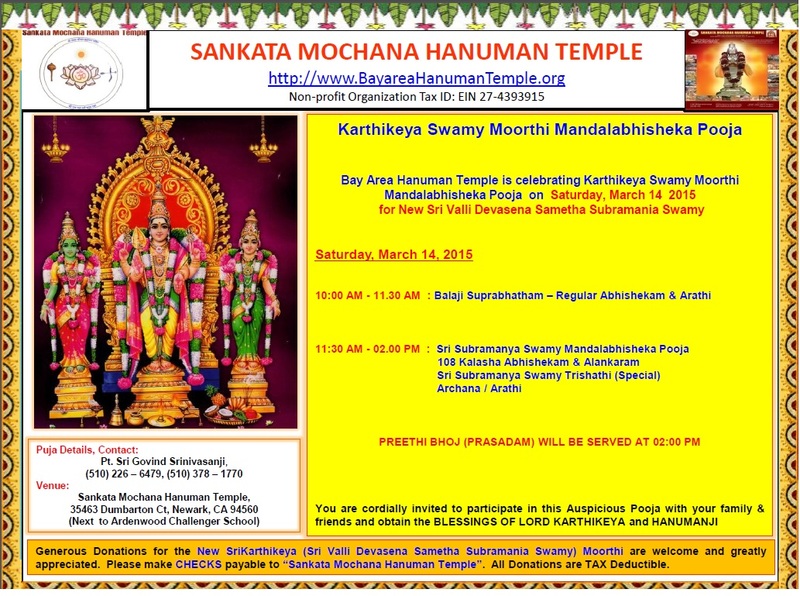 Monday, March 7th: 3:00 AM – 4:00 AM: Tritiyakala Vishesha Pooja and Rudra Homam. Monday, March 7th: 4:30 AM – 5:30 AM: Turiyakala (Chathurtam) Vishesha Pooja. Monday, March 7th: 6:30 PM – 7:30 PM: Maha Mrityunjaya Japam (Chanting). Monday, March 7th: 7:30 PM – 9:00 PM: Lord Shiva Abhishekam and aarti. Mata-ke-jagran: 8:15 PM – 01:00 AM (Sunday) on Saturday, March 19th, 2016. 8:15 PM – 01:00 AM (Sunday) Jai Mata bhajans and pooja. Punarvasu Celebrations: 07:00 PM – 09:30 PM on Thursday, March 17th, 2016. 07:00 PM – 09:30 PM Ram parivar pooja followed by a procession during which the Hanuman Chalisa will be chanted. Sundarkand Path: 10:30 AM – 01:00 PM on Sunday, March 13th, 2016. 10:30 AM – 01:00 PM Tulsidas Ramacharitra Manas Sundarkand path and pooja. Preethi bhoj will be served. 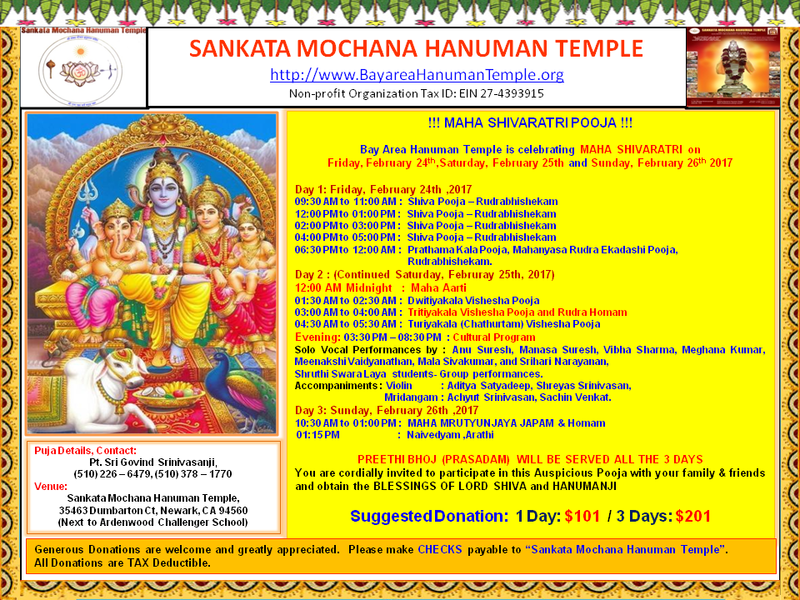 Sankata Hara chaturthi Celebrations: 07:00 PM – 09:30 PM on Thursday, February 25th, 2016. Sankata Hara chaturthi Celebrations: 07:00 PM – 09:30 PM on Monday, January 27th, 2016. Sundarkand Path: 10:30 AM – 01:00 PM on Sunday, February 14th, 2016. Mata-ke-jagran: 8:15 PM – 01:00 AM (Sunday) on Saturday, February 20th, 2016. Pradosham Celebrations: 07:00 PM – 09:30 PM on Friday February 19th, 2016. Punarvasu Celebrations: 07:00 PM – 09:30 PM on Friday, February 19th, 2016. Pradosham Celebrations: 07:00 PM – 09:30 PM on Thursday January 21st, 2016. Punarvasu Celebrations: 07:00 PM – 09:30 PM on Friday, January 22nd, 2016. Mata-ke-jagran: 8:15 PM – 01:00 AM (Sunday) on Saturday, January 16th, 2016. This is our annual wedding celebration of Goddess Andal with her Lord Shri Krishna. Jayashree Dasarathy, the artistic director of Jayashree Dasarathy’s Music School along with her students will present a brief music concert. The concert will be performed by the following students: Anjana, Adithi, Sowmya, Janani, Manogna, Nandhitha, Vishal, Vibhav, Amritha, Maya, Lakshmi, Shastha, Divya, Shivani, Vaishnavi and Thejas. Preeti bhoj will be served after the traditional Aarti. You are cordially invited to join us with your family & friends. 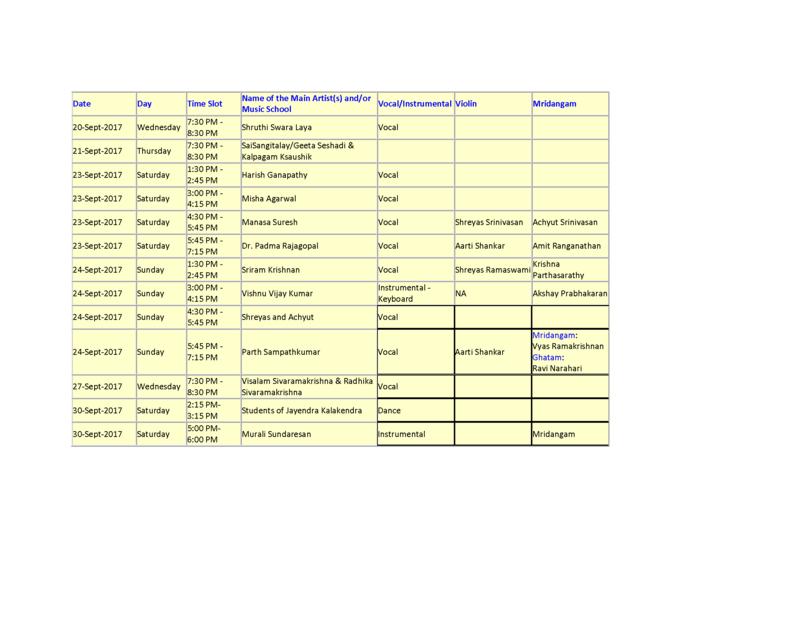 10:00 AM to 11:00 AM : Balaji suprabhatan, abhisekham and alankaram. Kalpana Kamalanathan, artistic director of Natyanjali Dance Academy will present several dance performances by their (14) students as a part of the annual Sankranti and Pongal celebrations. You are cordially invited to join us with your family & friends. 11:00 AM to 12:15 PM : Dance performance by the students of Natyanjali Dance Academy. Sundarkand Path and Havan: 10:30 AM – 01:00 PM on Sunday, January 10th, 2016. 10:30 AM – 01:00 PM Tulsidas Ramacharitra Manas Sundarkand path and pooja. Shri Krishna Kant Tiwariji and his group will lead this path. Havan will be performed during the path. Preethi bhoj will be served. Musical Concert by Dr. Padma Rajagopal, Mridangam: Akshay Bharadwaj. Dr. Padma Rajagopal had her early training from her grandmother, Natu Lakshmi Ammal, a disciple of the renowned musician of yesteryears, Kanchipuram Naina Pillai. Later, she had formal training under Sri Gopal Rao, a disciple of Thiruvottriyur Thyagayer.. She later had intensive training in concert singing under the popular musician Padmassri D. K. Jayaraman. She also had guidance from the well known artist-musician Sri S. Rajam and Thivarur Sethuraman. She has also learnt padams and javalis from Smt. T. Mukta. You are cordially invited to join us with your family & friends to usher in the new year. During this event, you can also participate in the Ramakoti writing drive. Writing materials will be provided. 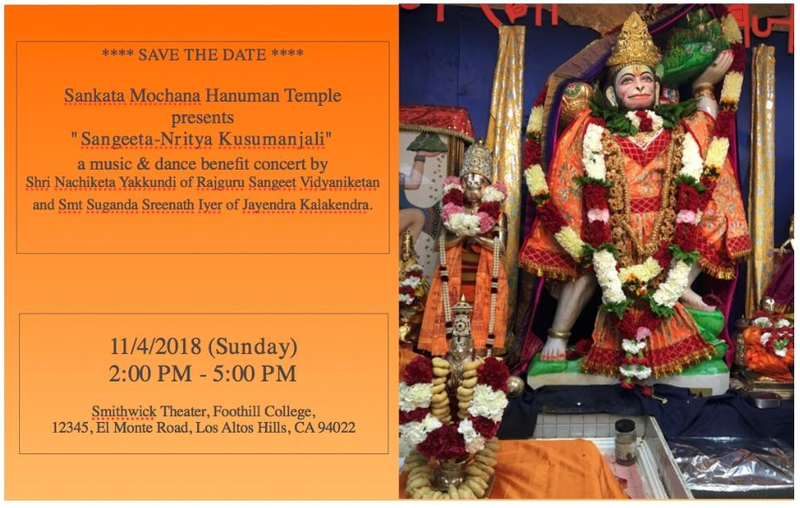 06:30 PM to 07:45 PM : Dance performance by students (10-12) from Smt Preetha Sheshadri`s Kalaniketan school of Indian music and dance, Cupertino. 07:45 PM to 08:30 PM : Smt Sruti Sarthy and Party – Violin concert. 08:30 PM to 11:00 PM : Ashwin Srikant along with Vignesh Thyagarajan (violin) and Ajay Gopi (mridingam). – Carnatic vocal concert. 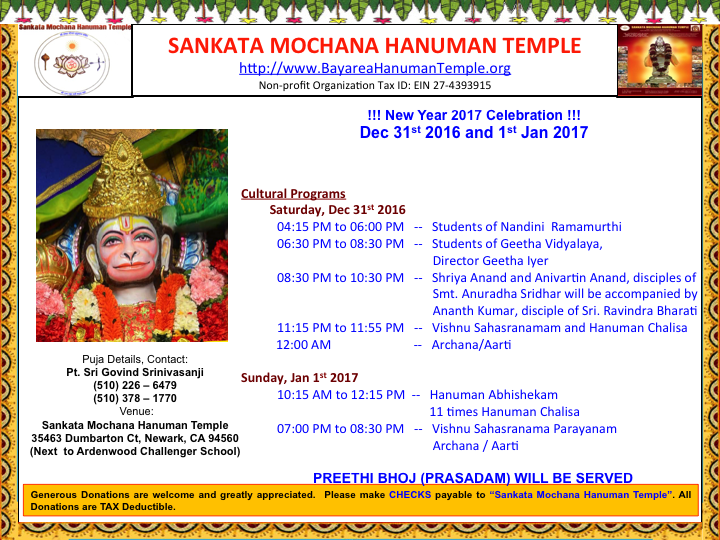 11:15 PM to 11:55 PM – Sri Vishnu Sahasranamam & Hanuman Chalisa followed by an aarati at midnight to usher in the new year. 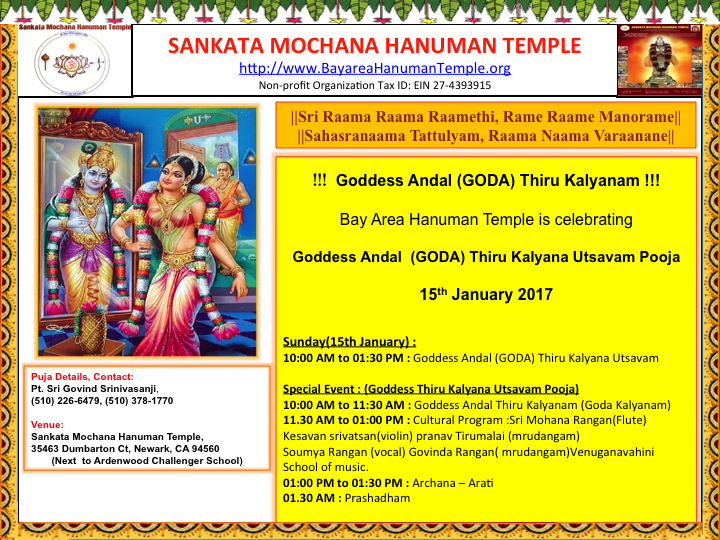 You are cordially invited to join us with your family & friends and obtain the blessings of Sri Lakshmi and Sri Hanumanji. During this event, you can also participate in the Ramakoti writing drive. Writing materials will be provided. 10:15 AM to 12:15 PM : Hanuman chalisa chanting (11 times) follwed by Sri Hanuman abhishekam, naivedyam, archana & aarthi. Preethi bhoj will be served. 06:30 PM to 07:15 PM : Hindustani violin concert. 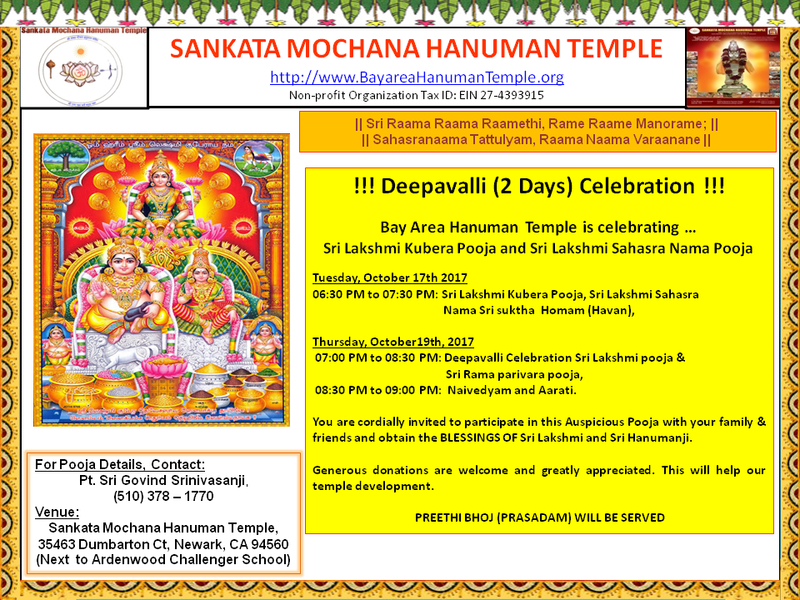 07:15 PM to 8:30 PM : Lakshmi puja. Punarvasu Celebrations: 07:00 PM – 09:30 PM on Saturday, December 26th, 2015. 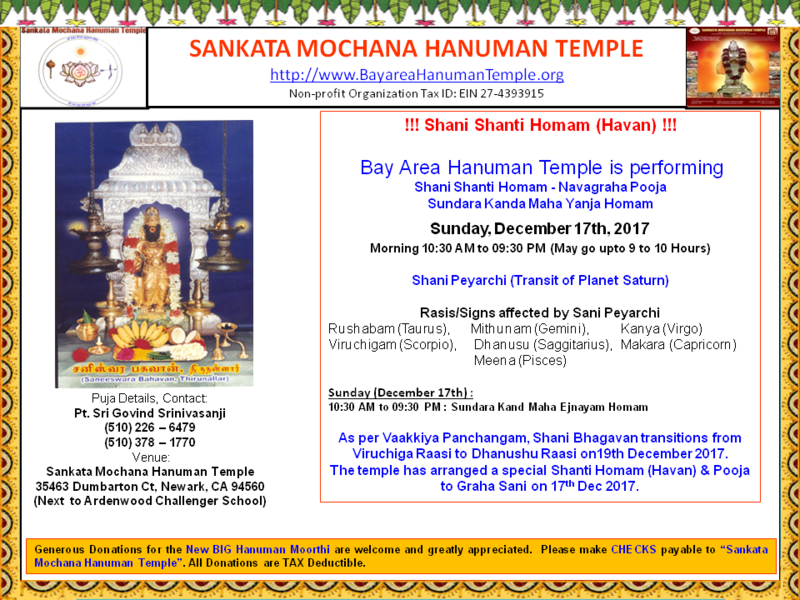 Sankata Hara chaturthi Celebrations: 07:00 PM – 09:30 PM on Monday, December 28th, 2015. 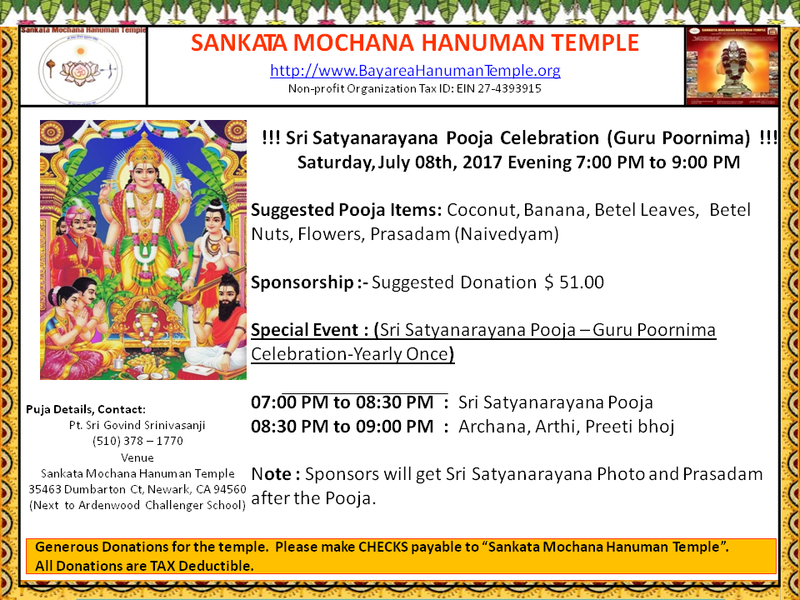 Please participate in this auspicious pooja with your family and obtain the blessings of Lord Karthikeya Swamy and Sri Hanumanji. During this event, you can also participate in the Ramakoti writing drive. Writing materials will be provided. 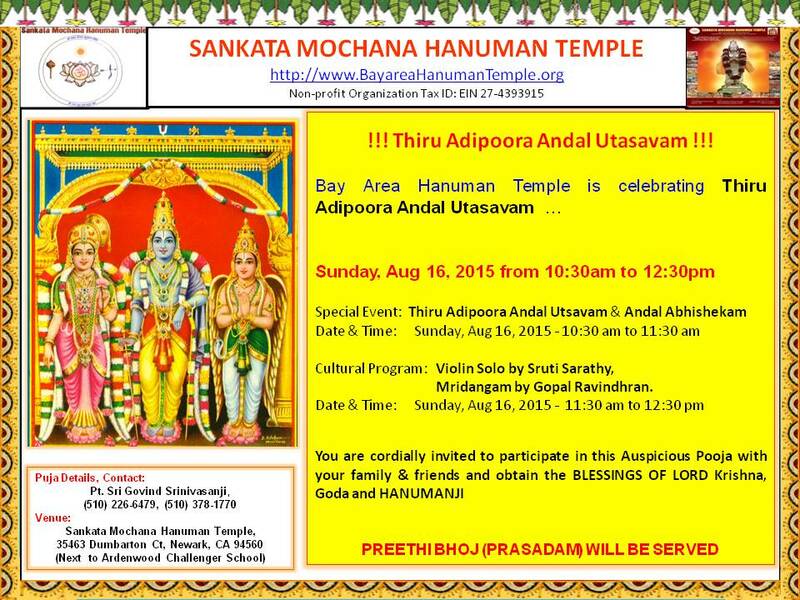 Preethi Bhoj (Prasadam) will be served after the aarati. 09:00 PM to 09:15 PM : Aarthi. Two days of Deepavali celebrations on Saturday, November 07th, 2015 and Tuesday, November 10th, 2015. The celebrations highlight a Lakshmi sahasranama havan followed by the Ramakoti samarpan to Lord Hanuman. 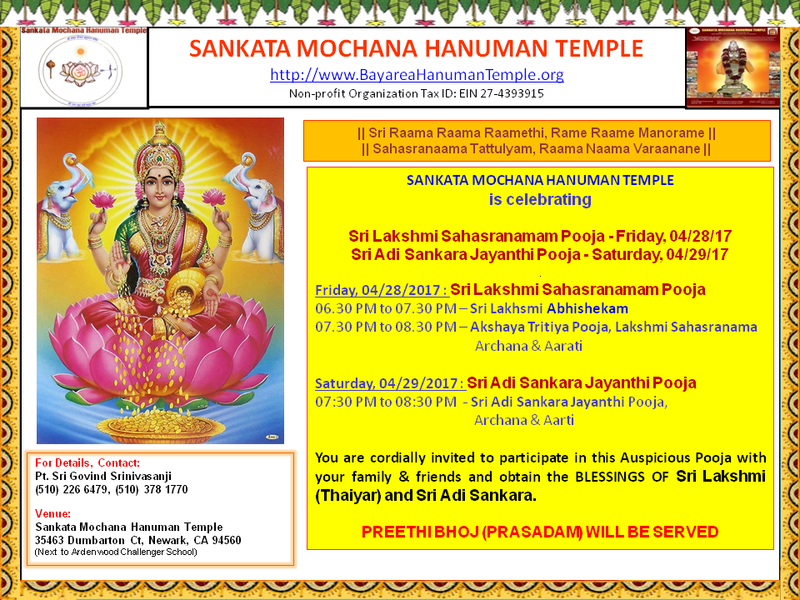 You are cordially invited to join us with your family & friends and obtain the blessings of Sri Lakshmi and Sri Hanumanji. Generous donations towards the temple development is greatly appreciated. 04:30 PM to 06:00 PM : Bharatha Natyam dance performance by Jayendra KalaKendra; Artistic director Smt. Suganda Iyer. Wednesday Oct 14, 2015 – 6:15 pm to 7:30 pm – Artists from Nandini Ramamurthy’s Musical Acadamy. Thursday, Oct 15, 2015 – – 6:15 pm to 7:30 pm – Artists from Latha Srinivasan’s Musical Acadamy. Friday, Oct 16, 2015 – – 8:00 pm to 9:30 pm – Artists from International Academy of Indian Music, Artistic Director Smt Kasthuri Shivakumar and Sri Paduka Academy, Artistic Director Sri Hari Devanath. Sunday, Oct 18, 2015 – 10:30am to 12 noon – Artists from Kalaniketan school of Music & Dance (Artistic Director Preetha Sheshadri) – 20 Children performing Bharatha Natyam. Sunday, Oct 18, 2015 – 2:00pm to 4:00pm – Artists from Bhairavi Music Acadamy, Artistic Director, Vydehi Sudharshan. 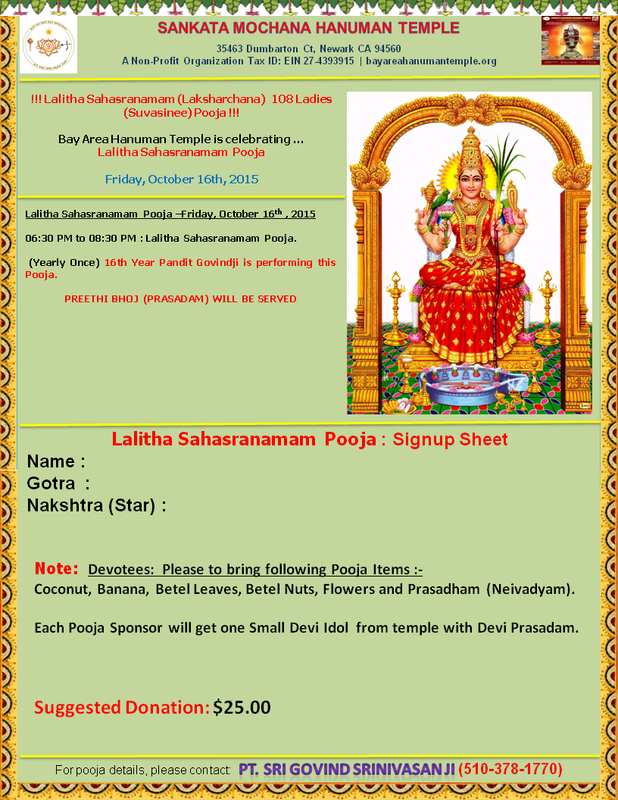 Friday Oct 16th Regular Lakshmi Abhishekam/Pooja at 10:00 am to 12:00 pm. Due to Lalitha Sahasranama/Suvasinee Pooja in the Evening, Regular Lakshmi Abishekam/Pooja will be performed in the Morning 10:00am to 12:00pm. This change is only for this Friday, Oct 16th. Sri Ganesha Chaturthi Celebrations – children`s program: 10:30 AM – 01:00 PM on Sunday, September 20th. 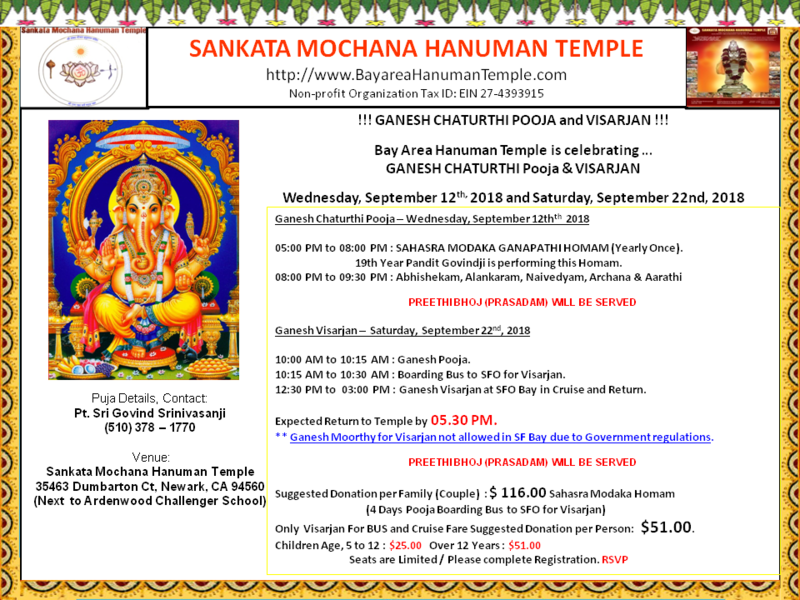 The SMH temple will conduct a special Shri Ganesh puja for the benefit of the young devotees. You are cordially invited to this auspicious event along with your family & friends. During this event, you can also participate in the Ramakoti writing drive. Writing materials will be provided. Preethi Bhoj (Prasadam) will be served. Obtain the blessings of Lord Sri Maha Ganapthi and Sri Hanumanji by participating in this event. 12:30 PM to 01:00 PM : Naivedyam & aarthi. 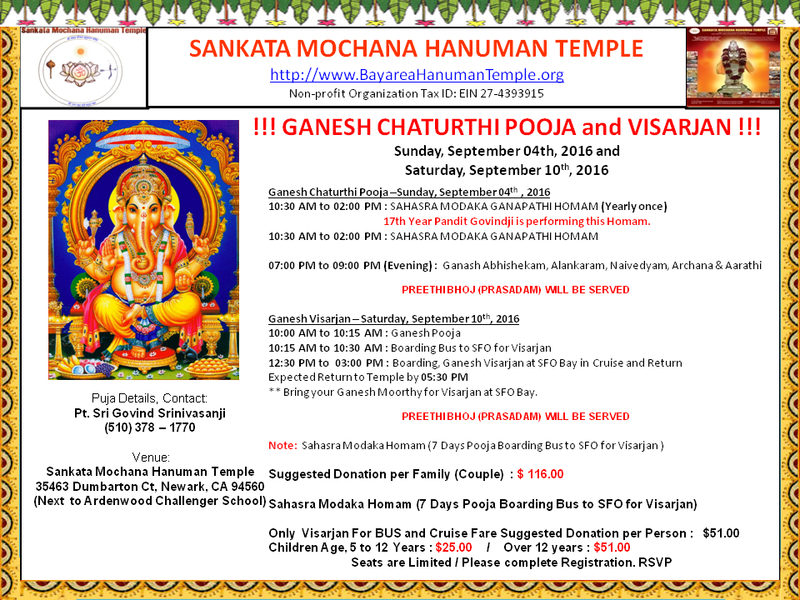 Sri Ganesha Visarjan: 09:30 AM – 04:00 PM (expected) on Saturday, September 26th. This annual day long event is very popular among our devotees. Pandit Govind Srinivasan will perform special pujas for the Shri Ganesha idols, before their ritual immersion. You can also bring along your Ganesh idol. The cost per ticket is $51/-. Please sign up early since space is limited. 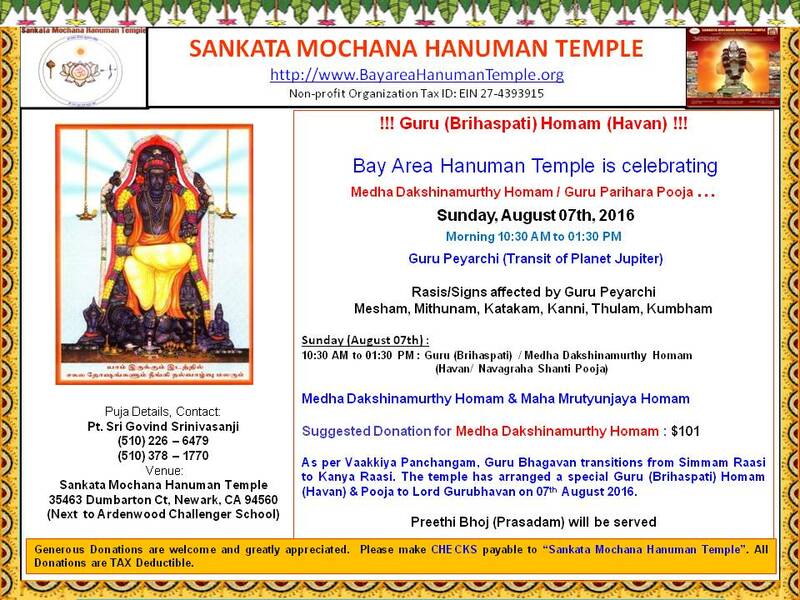 11:45 AM to 4:00 PM : Arrive in SF, boat cruise boarding, Shri Ganesha visarjan, return to temple. Sri Ganesha Chaturthi Celebrations: 06:00 PM – 10:30 PM on Wednesday, September 16th. Pandit Govind Srinivasan will be performing the ‘Sahasra Modaka Ganapathi Homam’ for the 16th year. You are cordially invited to this auspicious event along with your family & friends. 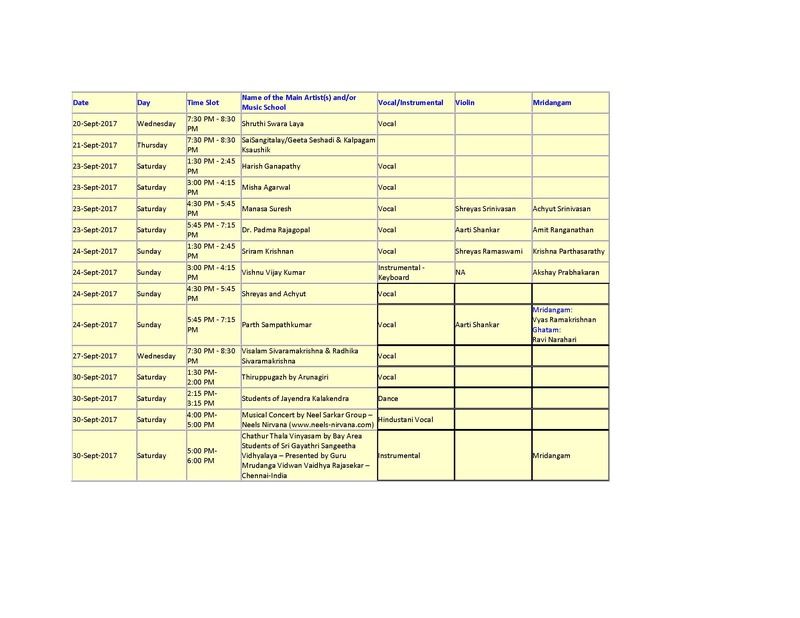 09:15 PM to 10:30 PM : Alankaram, abhisekham, naivedyam, archana & aarthi. Sri Krishna Janmashtami (birthday) Celebrations: 06:30pm – 12 Midnight on Saturday, September 5th. You are cordially invited to the grand celebrations of Krishna Janmashtami with your family & friends. The event will highlight Hindustani and Carnatic musical performances from our local music schools. Around midnight, there will be an enactment of Sri Krishna`s journey from Mathura to Brindavan which will be followed by a Sri Krishna aarthi. During these events, you can also participate in the Ramakoti writing drive. Writing materials will be provided. Preethi Bhoj (Prasadam) will be served. 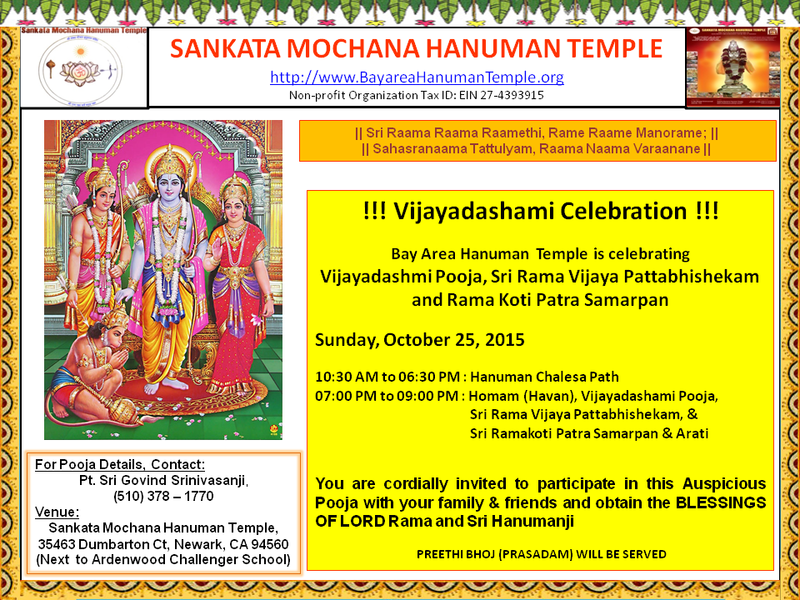 Obtain the blessings of Lord Sri Krishna and Sri Hanumanji by participating in this event. 08:00 PM to 09:30 PM : Smt Preetha Sheshadri`s Kalaniketan school of Indian music and dance, Cupertino. 09:30 PM to 10:30 PM : Smt Sruti Sarthy and Party – Violin concert. 10:30 PM to 11:30 PM : Smt Krishnapriya (Hindustani) will sing bhajans and keerthanas. 11:30 PM to 12 Midnight : Sri Krishna Janmashtami pooja, Krishna Janmothsav, naivedyam, archana & aarthi. 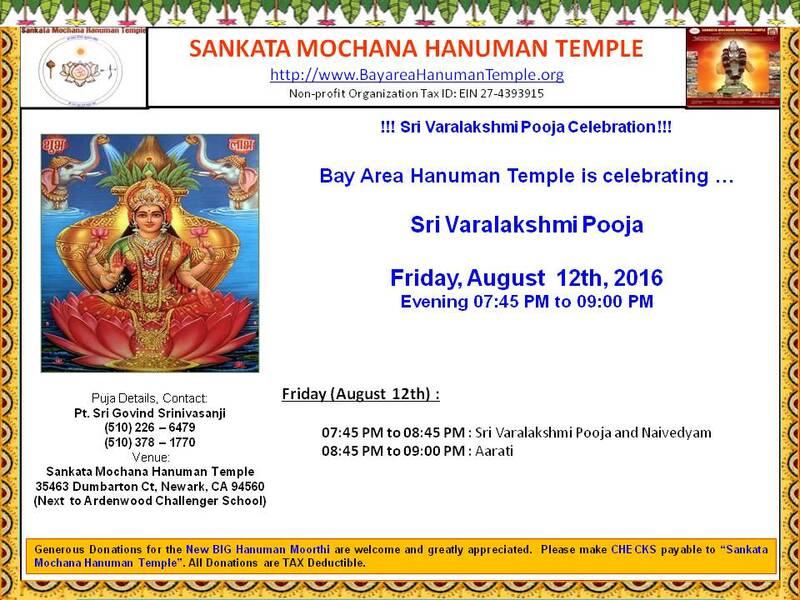 8:30 PM – 10:30 PM Jai Mata bhajans and pooja. Medha Dakshinamurthy Homam & Guru Parihara Pooja: Sunday, July 05th, 2015. This a special special Guru (Brihaspati) Homam (Havan) & Pooja to Lord Gurubhavan to celebrate Guru Peyarchi (transit of planet Jupiter). You are cordially invited to participate in this auspicious homam and pooja with your family & friends and obtain the divine grace. Preethi Bhoj (Prasadam) will be served after the pooja. 10:30 AM – 12:30 PM Tulsidas Ramacharitra Manas Sundarkhand path and pooja. This is a special five hour Mata-Ka-Jagran pooja. Sri Bunty Babaji will be conducting this event. 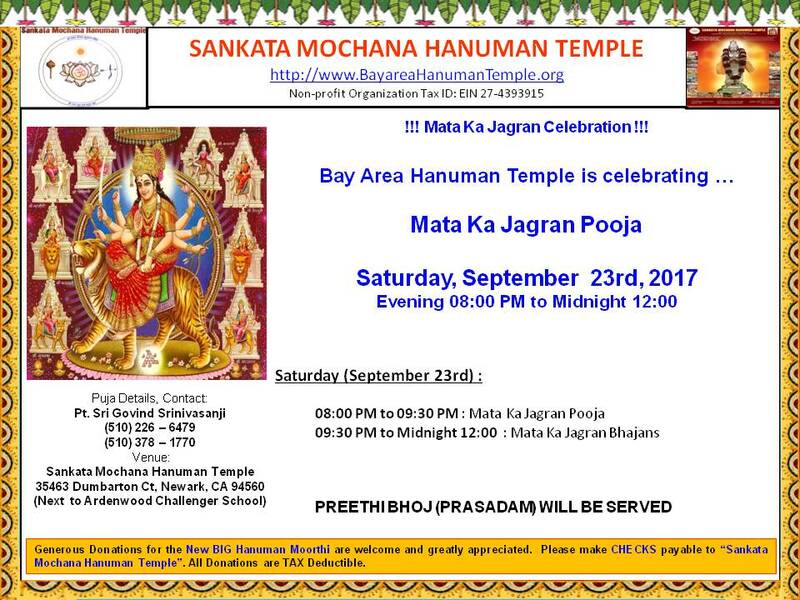 You are cordially invited to participate in this pooja with your family & friends and obtain the blessings of Jai Mataji and Sri Hanumanji. Preethi Bhoj (Prasadam) will be served after 8:30 PM. June 20th/21st: 08:30 PM to 01:30 AM : Sri Bunty Babaji will be leading the special bhajans, kirtans and aarti. 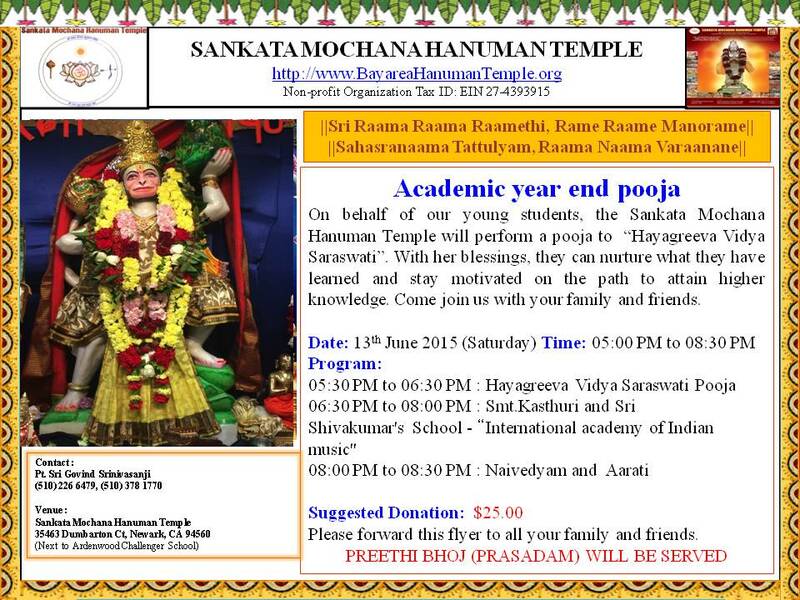 Academic year end – Hayagreeya Vidya Saraswathi pooja: Saturday, June 13th. Our young students have worked hard thru this academic year, gaining knowledge along the way. This is a special pooja to offer our gratitude and pray for their continued success. You are cordially invited to participate in this pooja with your family & friends and obtain the blessings of Goddess Saraswathi and Sri Hanumanji. It will be followed by a cultural program presented by Smt.Kasthuri and Sri Shivakumar’s School – “International academy of Indian music”. You can also participate in the Ramakoti writing drive during this program. Writing materials will be provided. Preethi Bhoj (Prasadam) will be served after the Naivaidyam and Aarti. June 13th: 05:30 PM to 06:30 PM : Hayagreeva Vidya Saraswati Pooja. June 13th: 06:30 PM to 08:00 PM : Smt.Kasthuri and Sri Shivakumar’s School – “International academy of Indian music”. June 13th: 08:00 PM to 08:30 PM : Naivedyam and Aarti. Narasimha Jayanthi celebrations & Sudarshana Homam: Sunday, May 3rd. May 3rd: 10:30 AM – 12:00 PM: Sri Lakshmi Sudarsana Narasimha Moola Mantra Homam (Havan), Poornahuti. May 3rd: 12:00 PM – 1:30 PM: Cultural Program – Kalanikethan School of Indian Music and Dance – Artistic Director: Smt. Preetha Sheshadri. May 3rd: 1:30 PM – 2:00 PM: Archana & Aarti. May 3rd: 2:00 PM – 3:00 PM: Dance Program – Natyanjali Dance Academy – Artistic Director: Smt. Kalpana Kamalanathan Tel: (510) 289-1016. Upcoming special events in April: 20th, 22nd & 23rd. 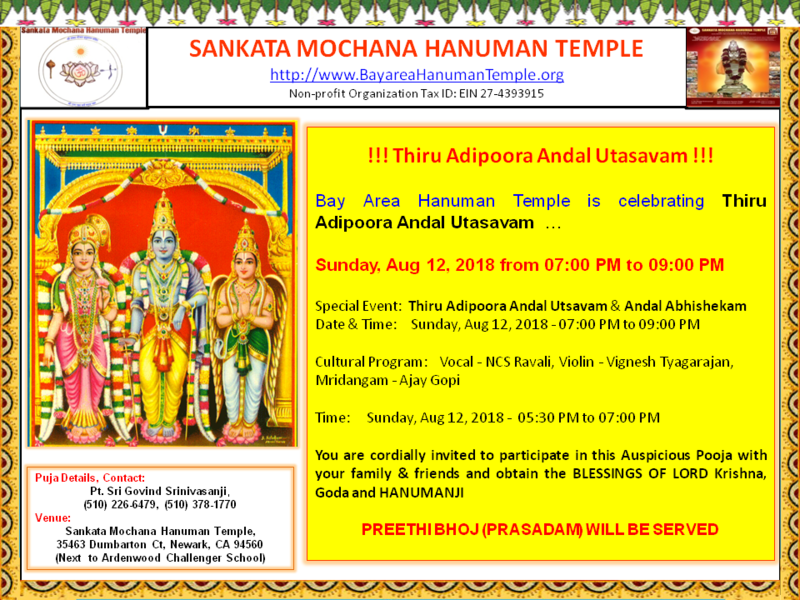 7:00 PM – 8:30 PM: Sri Ramanuja Thirunakshtra Utsavam, Archana, Aarti. 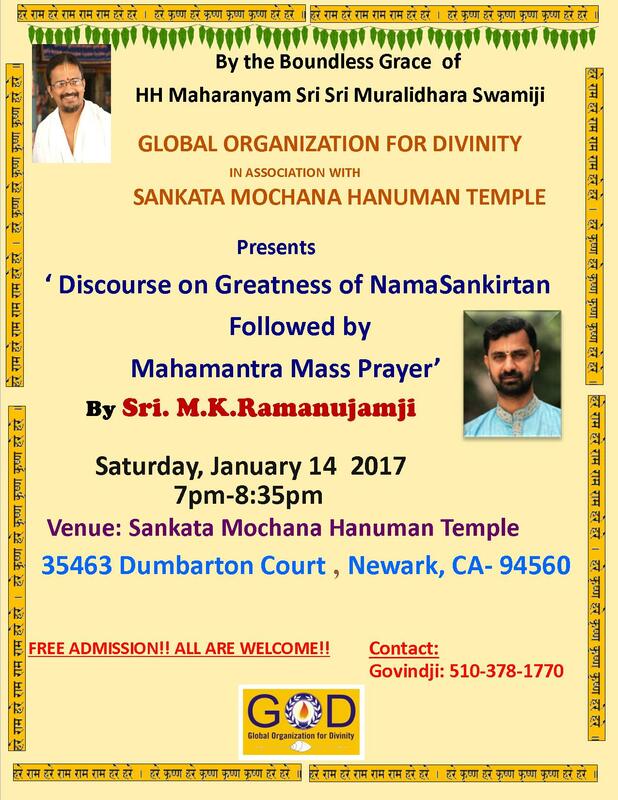 8:00 PM – onwards: We are privileged to host His Holiness Sri Krishna Desika Jeeyar Swamy the founder of the Sri Ranganatha temple Pomona NY. His Holiness will provide us an enlightening discourse on Srimad Ramayana. We invite you to attend this unique event along with your friends and family. 10:30 AM – 12:30 PM Tulsidas Ramacharitra Manas Sundarkand path and pooja. We have started the drive for collecting 10000 Ramakoti patrams by Hanuman Jayanthi. Please join us in this effort. Pandit Govind Srinivasan will start reading the Rambhaktha (devotee) names off the Ramakoti patrams on Ramanavami i.e March 28th. It will conclude on Hanuman Jayanthi i.e April 4th. A grand three day second anniversary celebrations which also highlights Sri Hanuman Jayanthi. It is also the culmination of the Ramakoti Patram drive. Preethi bhoj (prasadam) will be served on all three days. SriSuktham (Havan), Sri Hanuman Jayanthi and second anniversary celebrations. We invite you to join us and help make it a grand event. 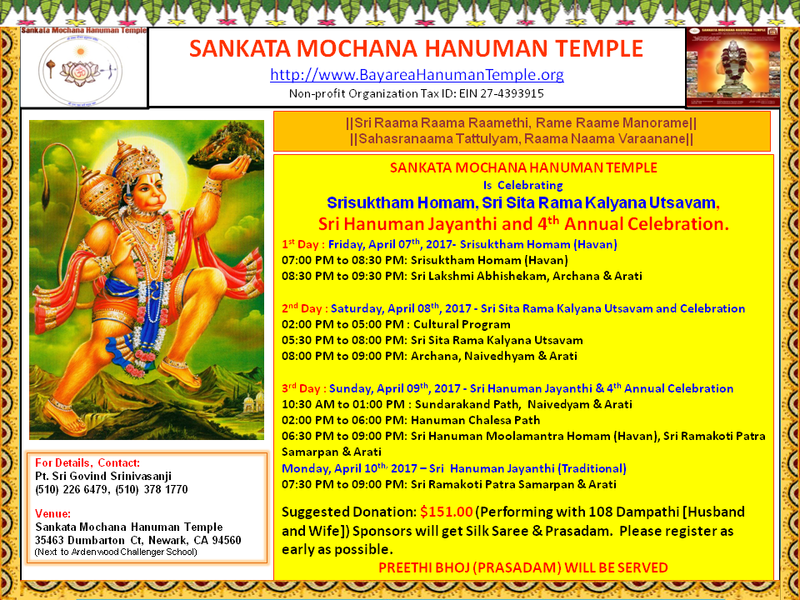 Friday, Apr 3rd: 7:00 PM – 8:00 PM: Sri Suktham (Havan). Friday, Apr 3rd: 8:00 PM – 9:30 PM: Sri Lakshmi abhisekham, archana and aarati. Saturday, Apr 4th: 10:30 AM – 06:30 PM: Sri Hanuman Chalisa Path. 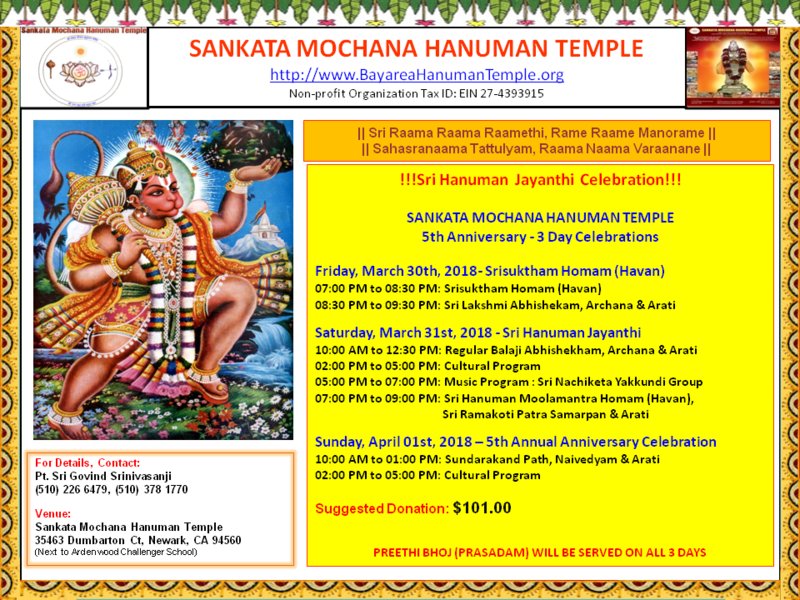 Saturday, Apr 4th: 7:00 PM – 9:00 PM: Homam (Havan), Sri Ramakoti samarpan, arati. Sunday, Apr 5th: 10:00 AM – 12:00 PM: Cultural program – Smt Hema Sista`s Sangitalaya school of music. Sunday, Apr 5th 1:00 PM: Aarati. During the week, Pandit Govind Srinivasan will read the complete Sri Valmiki Ramanayam which comprises of over 20,000 slokas. 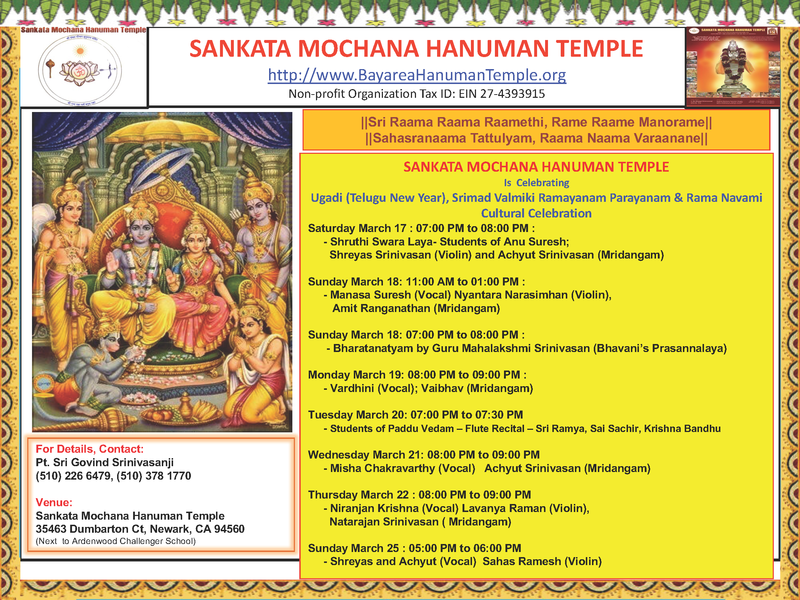 Mar 20th – Mar 28th: 9:30 AM – 02:30 PM & 5:00 PM – 7:00 PM: Valmiki Ramayana parayanam, naivaidyam and aarati. Several activities are planned for the weekend celebrations. We invite you to join us during these auspicious times. Preethi bhoj (prasadam) will be served on both the days. 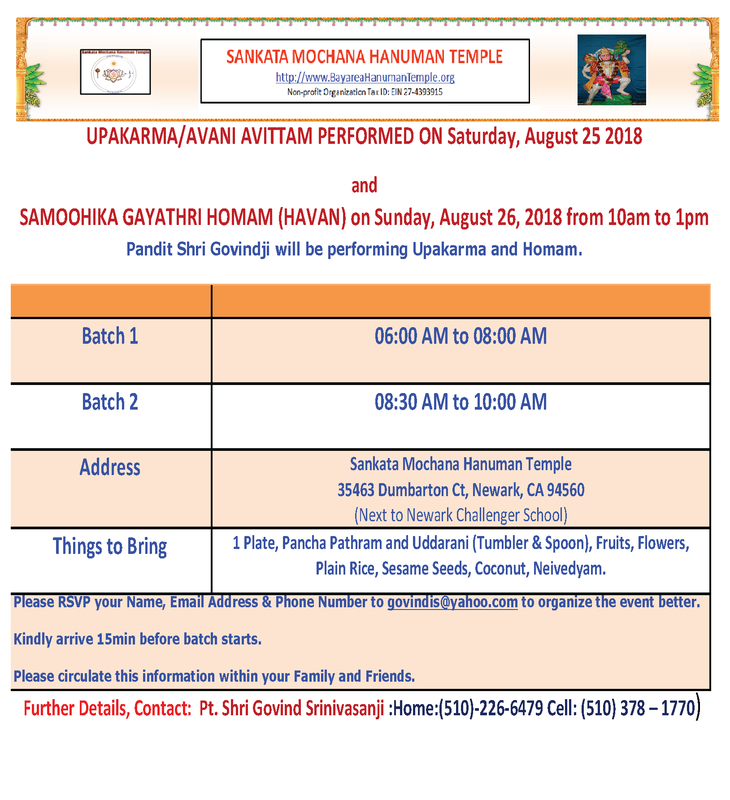 Signup sheets for the 24 hour Akhand Ramayan Path are available with Sudha: (510) 793-8672. Please signup for the one hour or two hour slots. 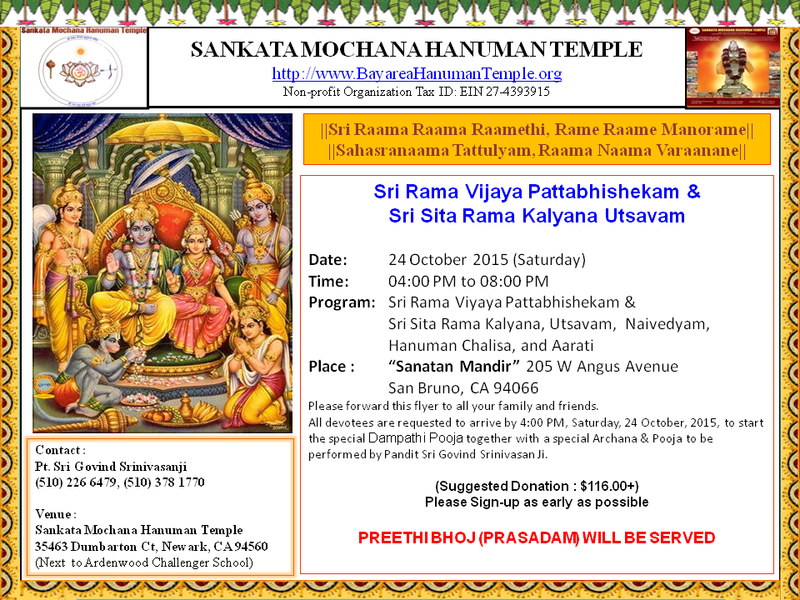 Saturday, Mar 28th: 12:00 PM – 01:30 PM: Sri Ramajanma utsavam, naivaidyam and aarati. Saturday, Mar 28th: 12:00 PM – 01:30 PM: Sri Rama Pattabhisekham, naivaidyam and aarati. Saturday, Mar 28th: 3:00 PM – onwards for 24 hours: Akhand Ramayan (Sri Tulasidas Ramacharitra Manas) Path. 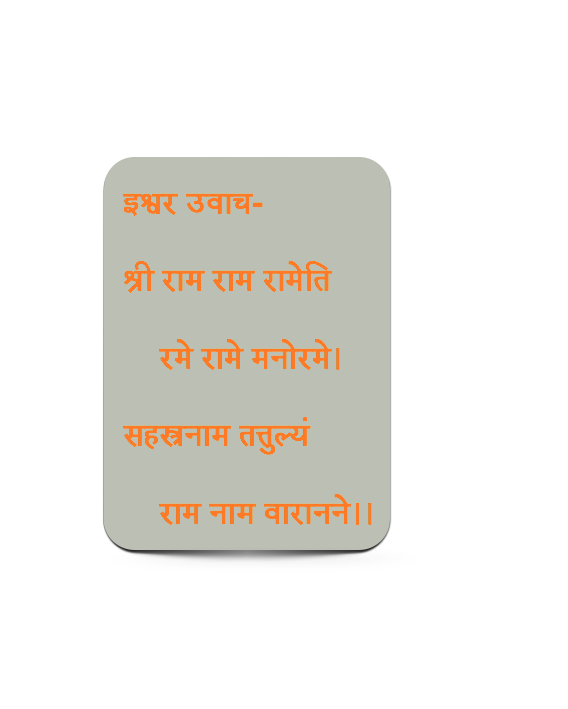 Sunday, Mar 29th: upto 3:00 PM: Akhand Ramayan (Sri Tulasidas Ramacharitra Manas) Path. Sunday, Mar 29th: 4:00 PM – 7:00 PM: Sri Seetha Rama kalayana utsavam, naivaidyam and aarati. Mar 14th: 11:30 AM – 02:00 PM: 108 Kalasha abhishekam & alankaram, Sri Subramanya Swamy Trishathi (Special); archana and aarathi. 10:30 AM – 12:30 PM Tulsidas Ramacharitra Manas Sundarkand path and pooja. Preethi bhoj will be served. Sankata Mochana Hanuman temple and Pandit Govindji wishes you and your family a very happy and prosperous New year – 2015. Jan 23rd: 7:00 PM – 09.30 PM Ganesh Pooja/Homam Anugnya Bhoomi Pooja, Sankalpam for Devotees. Jan 24th: 11:30 AM – 01:30 PM Ganesh Pooja-Kalasa Sthapanam-Adhivasa Homam Jaladhi Vasam-Poornahuthi Dhanyadhi Vasam. Moolamantra Homam-Suktati Homam-Bimbasuddhi Homam-Poornahuthi-Shayanathi Vasam-Aarti. 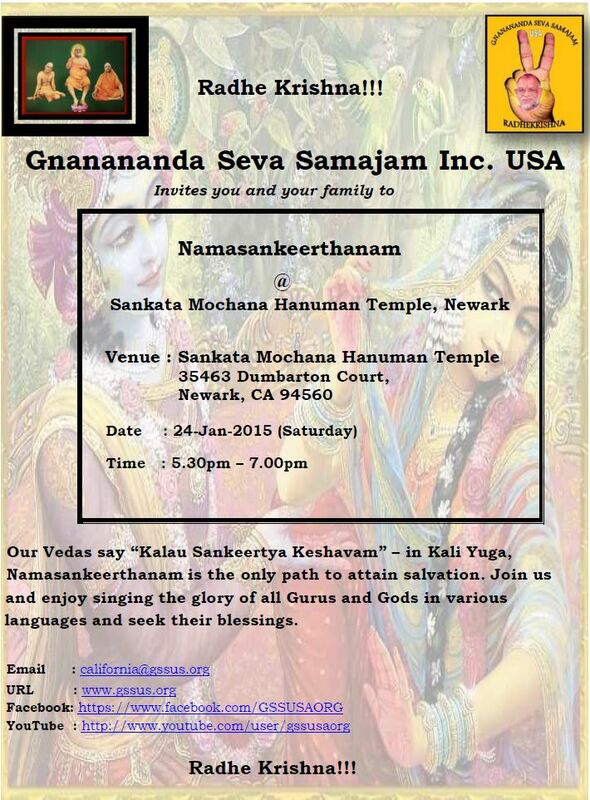 Cultural Program: Jan 24th Saturday 5.30pm to 7.00pm Namasankeerthanam by Gnananda Seva Samajam. Several Bay area music schools and artistes will be joining us for the year end celebrations. Come and enjoy an evening of devotional music with us. 7:00 PM – 8:00 PM Preetha Sheshadri`s Kalaniketan school of Indian music and dance, Cupertino. 8:00 PM – 9:00 PM Hema Sista`s Sangithalaya school of music. 9:00 PM – onwards Krishnapriya (Hindustani) and Pavithra Narasimha will sing bhajans and keerthanas. 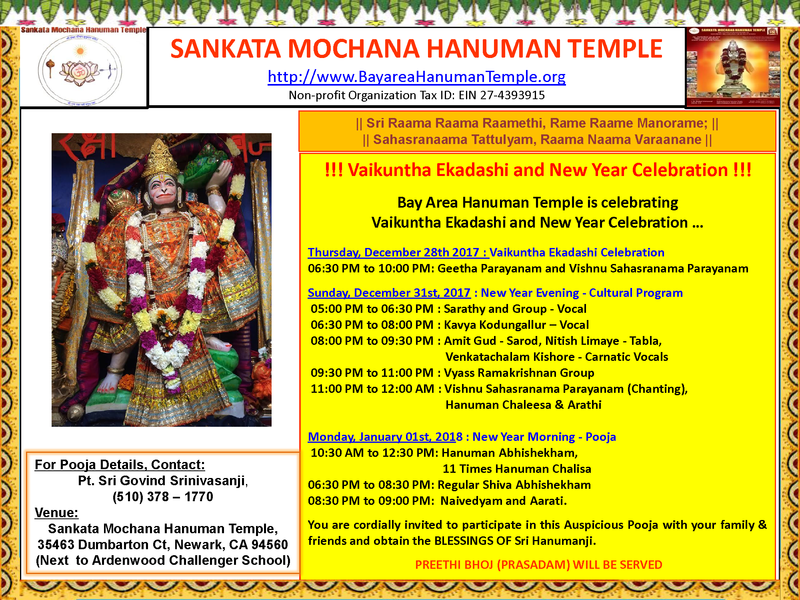 The Bay area Sankta Mochana Hanuman temple wishes you all a very happy New year. At the temple, the New year will be ushered in with the chanting (eleven times) of Hanuman Chalisa, followed by the Hanuman Aarthi. Panditji will be performing the Hanuman Abhisekham as a special New year pooja. Bhaspavaari paripurna lochanam; Maarutim namata raakshasanthakam. Wherever Sri Rama’s songs are sung, Sri Maruthi (Son of Wind God) with joyous tears in his eyes and folded hands over his head is present. To him we offer our namaskaram. ajADyam vAk paTutvam ca hanumat smaraNAt bhavet. You will be blessed with wisdom, strength, fame, valor, fearlessness, health, determination and articulacy by praying to Shri Hanuman. The musical event is accompanied by multimedia presentation of slides depicting the story being sung. The narrated story (performed by the 3 gurus) in English, will borrow from many of the saints; references to their work will be quoted in the original language. The additional visual slide will help the audience follow what goes on in a musical sequence. 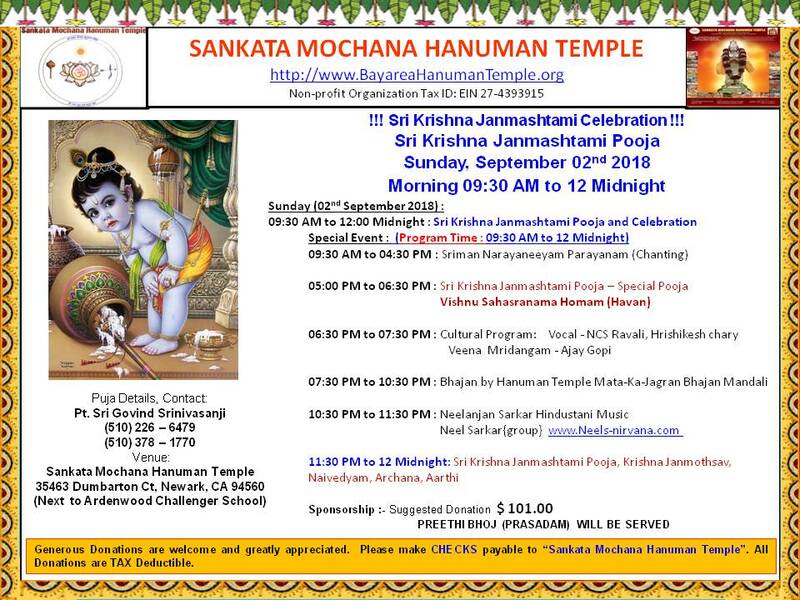 Please pick your tickets and come enjoy this delightful event thus offering your support to the Sankata Mochana Hanuman Temple fundraising efforts. 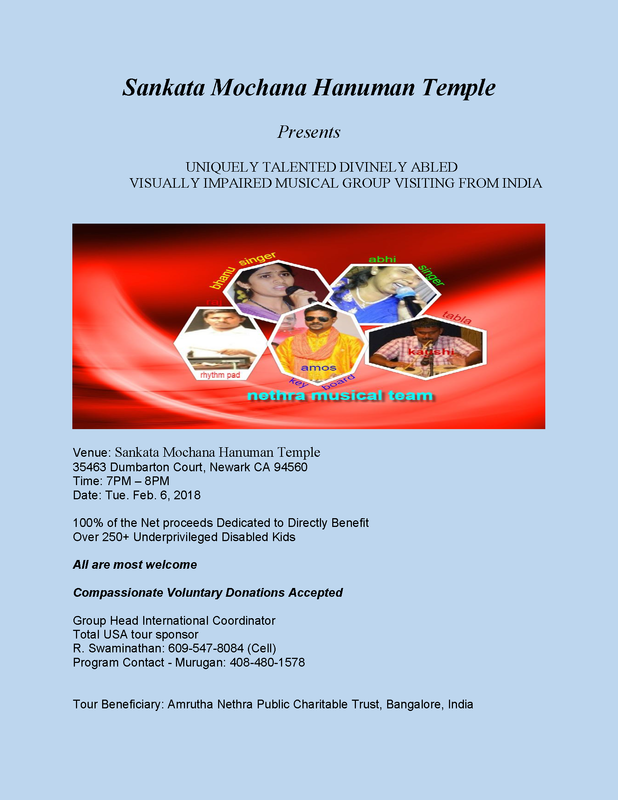 All proceeds of this concert is for the benefit of the temple. Deepavali celebrations: a music concert on October 25th. Students from Sri Padhuka Academy – disciples of Hari Devanath and Vivek Sundararaman ( disciples of Sri. 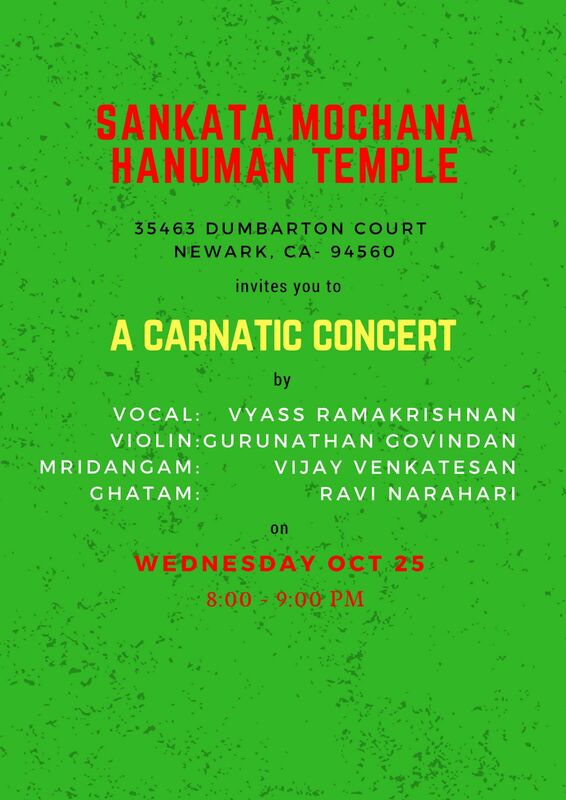 Neyveli Santhanagopalan ) would be singing classical Carnatic music on Saturday Oct 25th, between 7-9 PM @ the Sankata Mochana Hanuman Temple, Newark CA. This concert is a traditional rendition of the devotional compositions of several celebrated Carnatic music composers. It will be a Diwali treat to everyone. All are welcome to enjoy this event and encourage the young talent.